Proposed Plan of Improvements of Union Park. This is a rare and important 1871 example of Kellogg and Pollard Map or plan of Union Square, New York City. The Commissioners' Plan of 1811 united Bowery Road (now 4th Avenue) and Bloomingdale St. (now Broadway), and the former potter's field was designated as Union Place. It opened to the public in 1839, and as the city expanded northward, the area quickly became a desirable commercial and residential center for wealthy New Yorkers. Over the years, Union Square became the choice location for various public meetings, parades, protests and celebrations. In 1871, Parks Engineer in Chief M. A. Kellogg and Acting Chief Landscape Gardener E. A. Pollard created a new plan for Union Square. Famous landscape architects Frederick Law Olmstead and Calvert Vaux redesigned the park. They removed the fence and hedge and planted a variety of trees, widened the sidewalks and created a muster ground and reviewing stand 'to meet the public requirement of mass-meetings.' Like their most famous works, Central Park and Prospect Park, Vaux and Olmstead were meticulous in their design of the park, with every tree, pond, and bench planned. Today, because of Vaux and Olmstead's efforts, and the plan of Kellogg and Pollard, the citizens of New York City have the privilege of enjoying what is, without question, one of the finest examples of a planned urban public recreation and meeting places in New York City. This plan was created by M. A. Kellogg and E. A. Pollard for the First Annual Report of the Board of Commissioners of the Department of Public Parks for the Year Ending May 1, 1871. 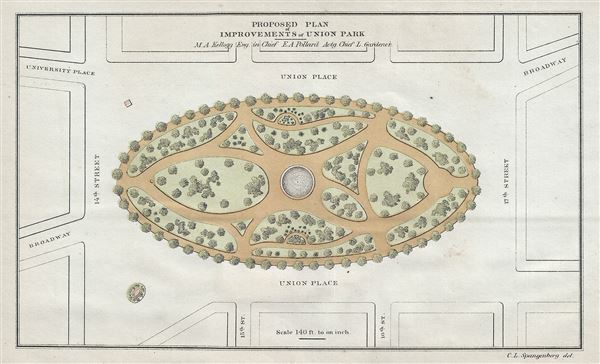 Maps of Union Square Park are exceptionally scarce, making this a rare find and an important addition to any serious collection focusing on New York City. William C. Bryant & Co., First Annual Report of the Board of Commissioners of the Department of Public Parks for the Year Ending May 1, 1871. Very good. Typical age toning. Minor spotting at places.